Photo Op: It is well worth the 186 stair climb for the stunning views of Old Town! This was my favorite museum we went to while in Prague! I loved how it was organized and after spending a few hours there I really had a sense of Alphonse Mucha's life story and his impressive oeuvre. Also note that you can find his work at the National Gallery and his stain glass window is in St. Vitus Cathedral. Photo Op: We went here on our first night in Prague and it was a gorgeous vantage point to watch the sunset and day turn to night over the Charles Bridge. For more information and the hours check out this website. This is one of the coolest art-house cinemas Lou and I have ever been to! If you are at all into alternative films you have to check out this movie theater. We went to a Bill Murray film festival while we were in Prague and had so much fun. They even had themed cocktails to go with the films. Definitely a hip and trendy crowd! We didn't spend much time here and missed the big highlight - the John Lennon Wall, but the island is super convenient when exploring the Mala Strana side of Prague. Photo Op: David Černý, a very famous modern Czech artist, has a large set of three bronze crawling babies located right next to Museum Kampa (a modern art museum). The island also boasts beautiful views of the Vltava River and a fun art installment of light up yellow penguins by the Cracking Art Group. This is something that everyone who visits Prague ends up seeing at least once. While it wasn't my favorite part of our trip (lots of crowds! ), I'm glad we saw it because the old buildings are beautiful and you can feel the history. It was founded in the 12th century. While we were there the Old Town Hall was under renovation, but I've read it is worth a visit so maybe check it out. The coolest part of Old Town for me was the Astronomical Clock which is located on the Southern wall of Old Town Hall. It is worth reading up on a bit before seeing it in action as there is so much meaning and history wrapped up into the different components of the clock. Photo Op: If you don't want to pay for the Prague Castle pass you are still allowed to enter the Cathedral and you get all the gorgeous views of the ceiling. Don't miss the Alphonse Mucha stained glass window on your right side just after the area where they scan tickets. Photo Op: This is one of the best photo ops in all of Prague! 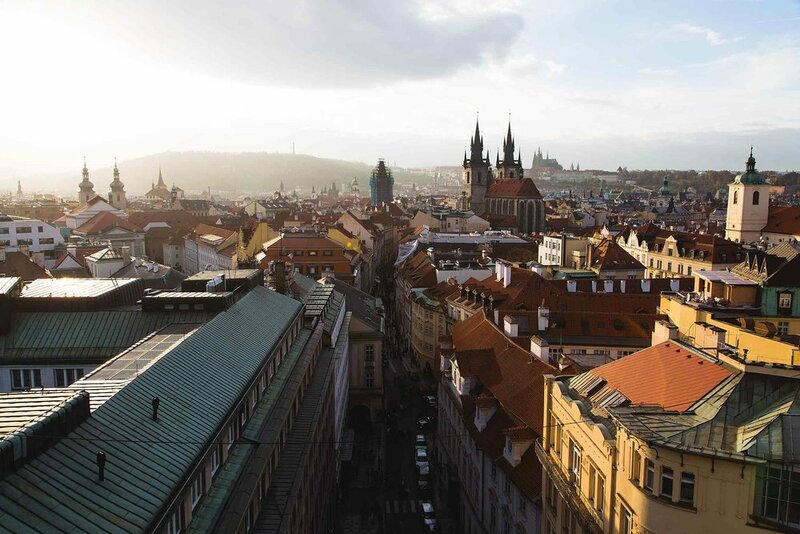 After climbing over 280 steps, you are about a 100 meters high with a 360 view of Prague. The best shots I thought were up towards Petrin Hill with a view of Petrin Tower and the Schönborn Palace or towards the Charles Bridge. We so, so highly recommend this campsite! Not only was it super affordable, but the staff was really nice and we even ran into a lovely British couple who watches our videos. Their blog is called Living the Veggie Life and they put up a blogpost about their time in Prague too.